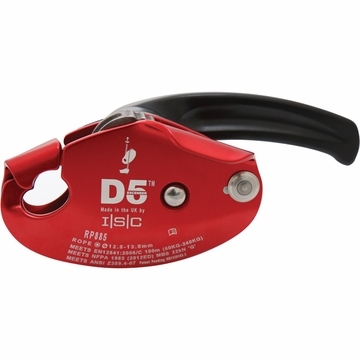 "The D5 Descender has a double safety locking mechanism, which means when loaded, the side plates cannot be rotated open due to the positioning of the carabiner and the push button click-lock safety closure. The D5 is easy to attach/detach from rope without detaching from the operator’s harness, therefore eliminating the risk of accidental dropping of the device. It is easy to back-feed the rope through the D5 and therefore it can be used for smooth ascending or for emergency hauling (when used as part of a 2:1 Z-rig). Certifications: EN12841, ANSI Z359, NFPA 1983"